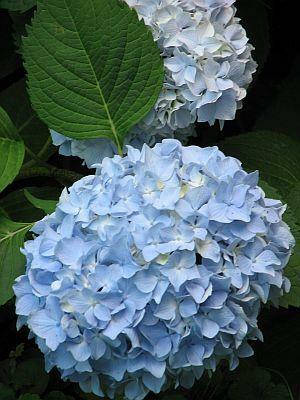 Endless Summer hydrangea is a variety of flowering perennial shrub of the family Hydrangeaceae. While similar in appearance to many other so-called mop-head or bigleaf hydrangeas, Endless Summer is distinct in its flowering pattern. While most hydrangeas produce blooms only on old wood, Endless Summer is able to flower on mature wood and new growth, allowing it to continue to produce flowers throughout the growing season. Flowering period is the defining characteristic of this hydrangea. Most hydrangeas bloom only for an all-too-brief period of a few weeks during the summer. Endless Summer, as the name implies, will show first blooms early in the summer, and if dead-headed regularly will continue to produce blooms until the first frost. In Northern climates this might mean three to four months of blooms, whereas in warmer zones Endless Summer can bloom continually for six months or more. Additionally, Endless Summer is one of the most frost-tolerant hydrangeas available. Northern gardeners know even a single mild frost at the wrong time can lay to rest any hopes of hydrangea blossoms for the entire season. This is another area where Endless Summer shines - even when damaged by a late spring frost, these shrubs will carry on with their intended purpose and adorn your garden with a full season of blooms. Like many hydrangeas, Endless Summer blossom color is based on the pH of the soil in which they grow. An acidic soil contains a higher percentage of available aluminum, which influences the hydrangeas to take on a blue color. Conversely, the aluminum in a highly alkaline soil is bound up in chemical compounds and is unavailable to plant roots. In the absence of aluminum, hydrangeas will turn to pink or even red. This can be affected by a number of factors, and even the calcium lime in nearby sidewalks or the acidity of compost mulch will have an influence on your hydrangea color. If you are looking for intensely colored hydrangeas, however, you may have better results with other cultivars. Endless Summer blossoms, no matter what the color, are usually softer in hue than other variants. Light pink, soft blue, or a delicate lavender will brighten your garden all season, but they will not usually achieve the vividness of other cultivars. It may be hard to believe of such an exotic-looking garden addition, but Endless Summer hydrangea is a truly versatile and adaptable plant. Equally comfortable in the coolness of zone four or the intense heat of zone nine, its only real requirement is continuously moist soil. This is especially important in hotter regions. Ensure your hydrangea has some protection from the sun during the hottest part of the day, and keep it well-watered to prevent wilting. Endless Summer has similar care requirements to other hydrangeas. Regular watering, an occasional pinch of fertilizer, and a good thick mulch are all that is needed to enjoy year after year of beautiful, all-season color. With so much beauty available for so little effort, the only challenge is finding enough space in your garden for your growing collection of Endless Summer hydrangeas.